Young parents get scared when they hear stories about the terrible twos. Take courage, though, you will survive the toddler stage. It's not easy to understand why your toddler has a tantrum but at such a young age, a child is consumed with thoughts of themselves. Everything is about them and how they feel. Until they are taught how to share, every toy or piece of food they see automatically belongs to them. Toddler temper tantrums can have a variety of effects. Your first thought might be that everyone is focused on you and your screaming child, but getting embarrassed wonít diffuse the situation. Besides, as a parent, you have many more years of embarrassing situations to look forward to courtesy of your children. So worrying about what others think during this situation is simply going to stress you and make you feel worse. 1. Ignore the tantrum. This technique works best when at home. In public places, you don't want to ever leave your child unattended as a form of punishment. Good behavior in public begins at home. Ignoring a toddler is not harsh. If your child is squirming on the floor screaming for a cookie, continue to talk to them as if you never noticed. Eventually, they will get the hint and stop screaming. 2. Avoid instant gratification. In public, toddlers throw tantrums when they are denied something that they want. Some parents give in to keep their child quiet but a child learns quickly. Tantrums will continue if they know you will cave. Simply tell them ìnoî and keep moving. 3. Don't get angry. When you scream and they scream the situation is wildly out of control. Youíll end up crying and your toddler will still be screaming. In any situation, raised voices mean civilized conversation has ended in favor of basic primal instincts. Donít revert back to the days of early man. Keep using the same calm voice you use when they are behaving to get your child to calm down as well. 4. Praise your toddler when they behave well. Positive reinforcement is better than negative. In the absence of positive attention a child will behave badly just to get some attention at all. 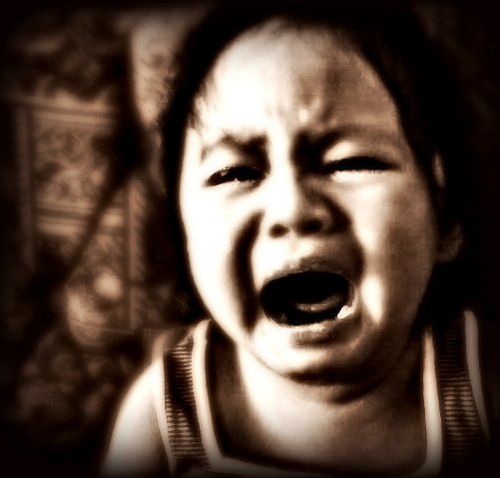 Acting out and throwing tantrums may be a cry for attention. Don't let it get to this point. Clap and celebrate when they go to the potty successfully and when they put away their toys. Good manners such as saying "please" and "thank you" deserve a smile and a hand clap as well. 5. Run errands after nap time. Kids get punchy when they get tired. A toddler misbehaves more often if they are dragged around when they are tired. 6. Carry snacks with you. Low blood sugar can lead to tantrums. If you are out longer than anticipated and lunch or dinner time is close at hand, let them eat a healthy snack to keep their hunger pains at bay and sugar levels stable. 7. Be consistent in your punishment. At home, you might use "time out" to deal with a tantrum for bad behavior. In public do the same. Sit your child on a bench for five minutes or take them to the car. Eventually they will learn that you are not a pushover and they will begin to behave. You will survive the toddler years. Nip temper tantrums in the bud with the above tips. Oooh! This is a proud moment. Teacher Mama Tina just read my blog. :) I have been visiting your blog for quite some time now. I wanted to home school Henry but I'm afraid I do not have the luxury of time to do it especially since clerkship is coming up next year. Thank you for visiting my blog teacher Mama Tina, it's such an honor. I'm experiencing this with my 1.4mos old daughter. Me and my husband are having a rough time. Looking forward for the word "trouble twos" by next year siguro. With our eldest kasi, takot sa akin. Isang tingin ko lang, behave na eh. I'm getting my karma siguro hahaha! Ganito daw ako kalikot sabi ng mom ko eh. Visiting from CommEx 10/23. This is really nice tip. My son is always having tantrums when get upset. I'll do some of these tips. I will remember all these. Pretty soon my baby will be all over the place and will start tantrums too, i bet. Thanks for these tips. We are already using some of the tips to our son and it really works.